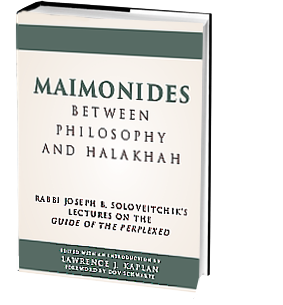 This book is the first and only comprehensive study by the noted twentieth-century rabbinic scholar and thinker, Rabbi Joseph B. Soloveitchik of the philosophy of Maimonides. Kaplan has succeeded in capturing and bringing to life Soloveitchik’s unique voice, his force and power. In these lectures Soloveitchik emerges as a major commentator on the Guide. In a wide ranging analysis he eloquently and incisively explores such diverse topics in Maimonides’ philosophy as his views on prophecy, the knowledge of and approach to God—normative, intellectual, and experiential, divine knowledge, human ethics and moral excellence, the divine creative act, imitation of God, and the love and fear of God. He also undertakes an extensive and penetrating comparison and contrast of Maimonides’ and Aristotle’s philosophical views. But beyond Soloveitchik’s acute and highly original analyses of individual passages and themes from the Guide, over the course of these lectures he gradually develops and unfolds, a profound and challenging overall approach to and interpretation of the central and critical issue addressed by the Guide, namely, the relationship between philosophy and divine law. All this culminates in a highly dramatic conclusion, which, in laser-like fashion, succeeds in shedding a bright light on the thought of both Maimonides and Soloveitchik—these two great philosophers and rabbinic scholars.